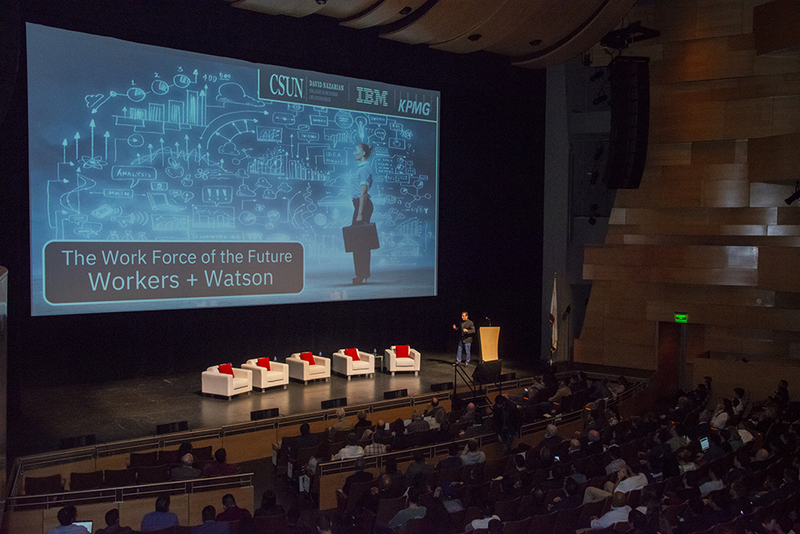 Keynote speaker Steve Canepa of IBM addresses students, faculty, staff, alumni and guests at "Workforce of the Future," a partnership program between CSUN's David Nazarian College of Business and Economics, IBM, and global accounting and audit firm KPMG. 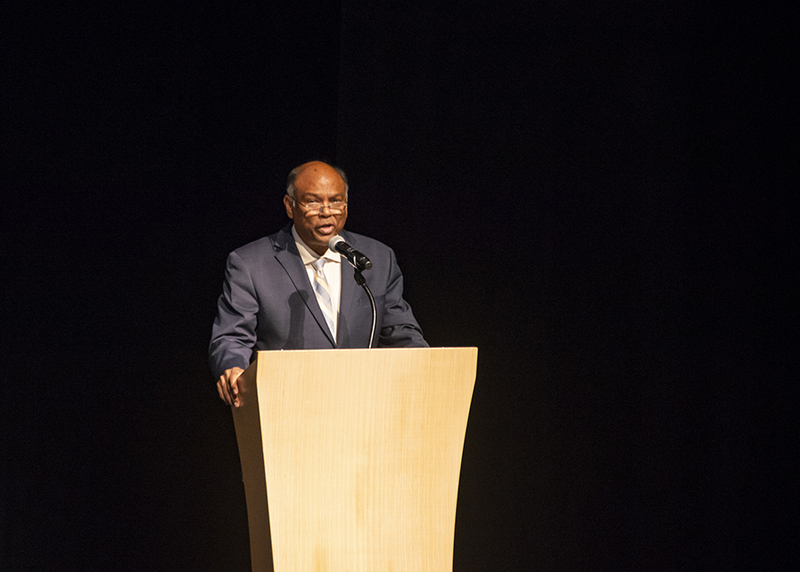 The program took place Nov. 13, 2018, at the university’s Younes and Soraya Nazarian Center for the Performing Arts. Photo by David J. Hawkins. Keynote speaker Steve Canepa of IBM addresses students, faculty, staff, alumni and guests to "Workforce of the Future," a partnership program between CSUN's David Nazarian College of Business and Economics, IBM, and global accounting and audit firm KPMG. The program took place Nov. 13, 2018, at the university’s Younes and Soraya Nazarian Center for the Performing Arts. Photo by David J. Hawkins. Chandra Subramaniam, dean of CSUN's David Nazarian College of Business and Economics, welcomes students, faculty, staff, alumni and guests to "Workforce of the Future," a partnership program between the Nazarian College, IBM, and global accounting and audit firm KPMG. The program took place Nov. 13, 2018, at the university’s Younes and Soraya Nazarian Center for the Performing Arts. Photo by David J. Hawkins. Keynote speaker Steve Canepa of IBM (far left) and Nazarian College Dean Chandra Subramaniam (center) gather onstage with expert panelists from IBM and KPMG to answer questions from students, faculty, staff, alumni and guests at "Workforce of the Future," a partnership program between CSUN's David Nazarian College of Business and Economics, IBM and KPMG. The program took place Nov. 13, 2018, at the university’s Younes and Soraya Nazarian Center for the Performing Arts. Photo by David J. Hawkins. Panelist Bindiya Khurana of KPMG answers a student's question at "Workforce of the Future," a partnership program between CSUN's David Nazarian College of Business and Economics, IBM and KPMG. The program took place Nov. 13, 2018, at the university’s Younes and Soraya Nazarian Center for the Performing Arts. Photo by David J. Hawkins. Expert panelists from IBM and KPMG answer questions from students, faculty, staff, alumni and guests at "Workforce of the Future," a partnership program between CSUN's David Nazarian College of Business and Economics, IBM and KPMG. The program took place Nov. 13, 2018, at the university’s Younes and Soraya Nazarian Center for the Performing Arts. Photo by David J. Hawkins. 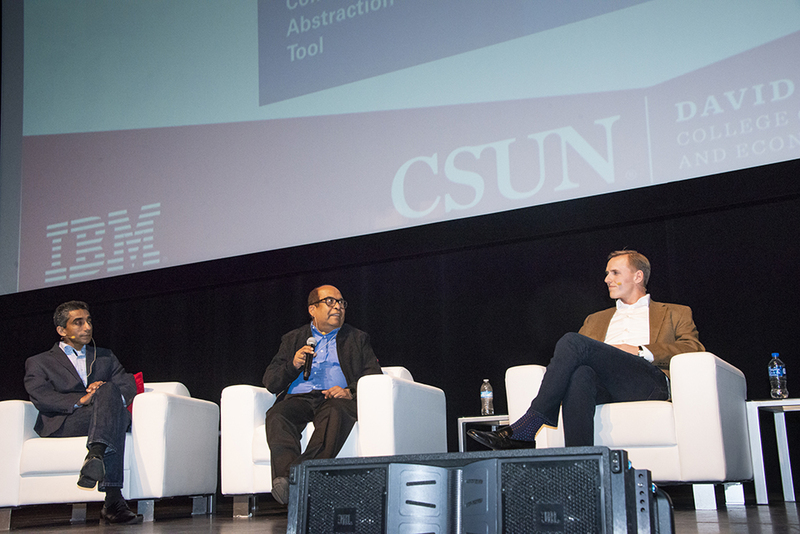 (L-R) Panelists Utpal Mangla, Luca Marchi and George Kreitler of IBM answer questions from students at "Workforce of the Future," a partnership program between CSUN's David Nazarian College of Business and Economics, IBM and KPMG. The program took place Nov. 13, 2018, at the university’s Younes and Soraya Nazarian Center for the Performing Arts. Photo by David J. Hawkins. Panelists George Kreitler (right) and Luca Marchi (left) of IBM answer questions from students at "Workforce of the Future," a partnership program between CSUN's David Nazarian College of Business and Economics, IBM and KPMG. The program took place Nov. 13, 2018, at the university’s Younes and Soraya Nazarian Center for the Performing Arts. Photo by David J. Hawkins. Wearing a black mock turtleneck, black blazer, jeans and a chin microphone, strolling the stage of The Soraya in front of a huge projection screen, IBM’s Steve Canepa seemed to be channeling Facebook’s Mark Zuckerberg, Tesla and SpaceX’s Elon Musk — and especially the late CEO of IBM’s rival, Steve Jobs. And the students loved it. Hundreds of California State University, Northridge accounting, business, entrepreneurship and marketing students packed the university’s Younes and Soraya Nazarian Center for the Performing Arts on Nov. 13 for Workforce of the Future, a partnership program between CSUN’s David Nazarian College of Business and Economics, IBM, and global accounting and audit firm KPMG. It wasn’t the generous spread of hors d’oeuvres from the Orange Grove Bistro that drew the crowd of undergraduates, their professors and alumni — although that didn’t hurt. They filled The Soraya’s lobby before and after the program, thronging around Canepa and the young, dynamic panelists from IBM and KPMG who joined him. They turned in stacks of question cards for the panelists to answer, touching on issues of artificial intelligence (AI), accounting technology, entrepreneurship and the skills that today’s CSUN students must master to succeed in their future careers. “We hope today’s program will be the first in a series of programs on the workforce of the future,” said Chandra Subramaniam, dean of the Nazarian College. “These rapid advances present real challenges to colleges and universities. How do we balance a deliberative and structured process in the face of immediate transformation of entire industries? There are no easy answers or solutions, but we can start by working on our culture. Subramaniam noted that the college partnered with KPMG and IBM because of their size, reputation and global reach, as two of the most widely respected firms across the globe. 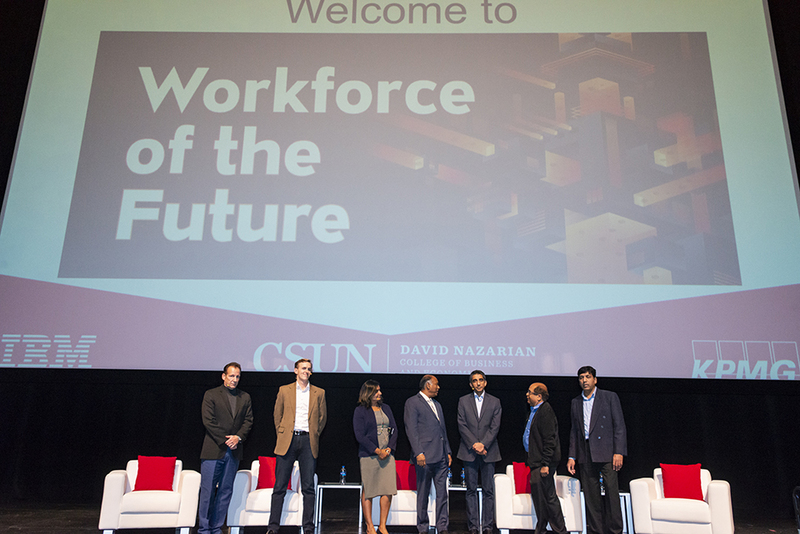 The companies’ expertise in “big data,” AI, blockchain, machine learning, process robotics and the “internet of things” are just a few of the topics that CSUN hopes these corporate partners and experts will share with the university’s undergraduates, graduate students and faculty in the years to come, the dean said. 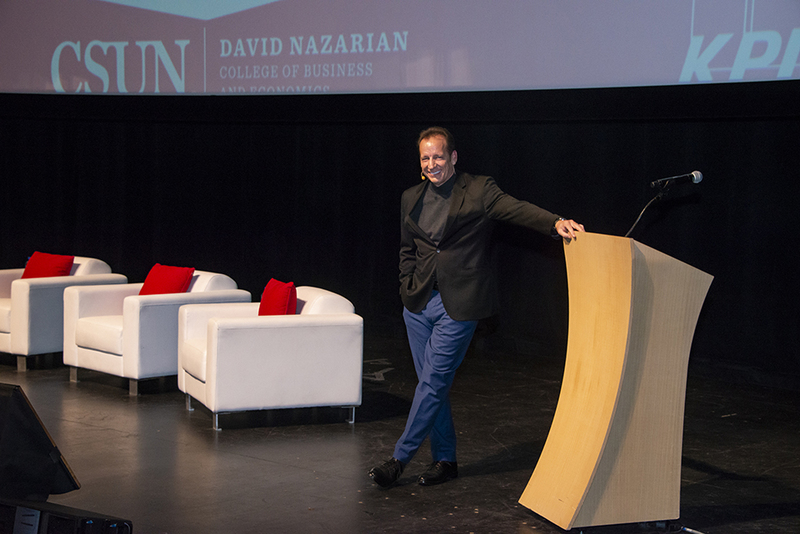 “These are exciting times for the Nazarian College,” he said. “Energy, innovation and a sense of mission and purpose drives our college. We have more than 7,000 students, which makes us the second-largest college of business in California, and the ninth-largest in the U.S. The high quality of the program is well known in Southern California, given that CSUN’s business alumni are disproportionately represented at the partner level in public accounting and at the CFO level in the industry. Canepa, IBM’s general manager for global media and the entertainment industry, talked about the applications and societal implications of IBM’s Watson, a massive AI engine that became a household name across the nation when it beat two human contestants on the TV game show Jeopardy! on Feb. 14, 2011. “For the IBM brand, that was a pretty big moment. Watson had gotten so much better at playing [Jeopardy! ],” Canepa said. “We knew there was a good chance that Watson would win. “So why do we need AI?” he continued. “There are some fundamental things that are shifting in the way competition happens in the marketplace. Firms are trying to stand out from the competition. [As consumers], we expect companies to make offers to us that are relevant to what we want. Canepa also touched on the massive growth of data in accounting and business, including in media and the entertainment industry: 1.7 megabytes (MB) of new data is created every second, for every human on the planet, according to Canepa. Video files are a huge share of that total data, he said, thanks to the growth in popularity and supply of videos for education, surveillance, government and medical services, to name just a few. He followed his talk with a panel discussion with five leaders from IBM and KPMG, which has worked with IBM on Watson for years. 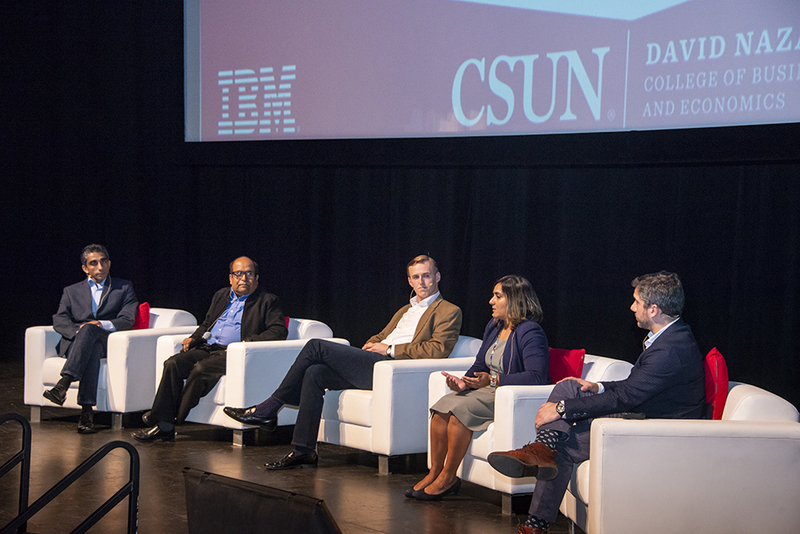 “We partner with a lot of schools and universities; however, this Workforce of the Future series we are doing with CSUN is unique in North America,” said Utpal Mangla of IBM. 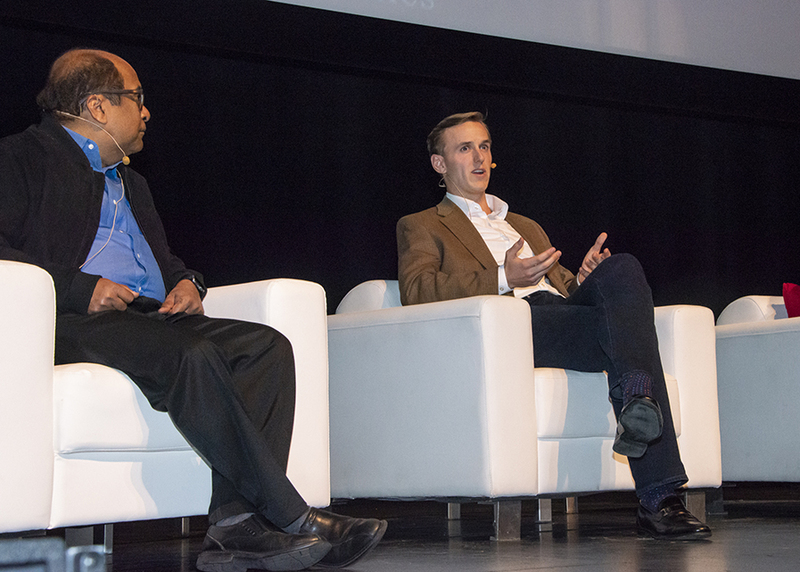 “For AI, in business, you need humans to make those final decisions. It’s not that the workforce is reducing, but the workforce needs to be ‘re-skilled’” to take advantage of these tools, he said. 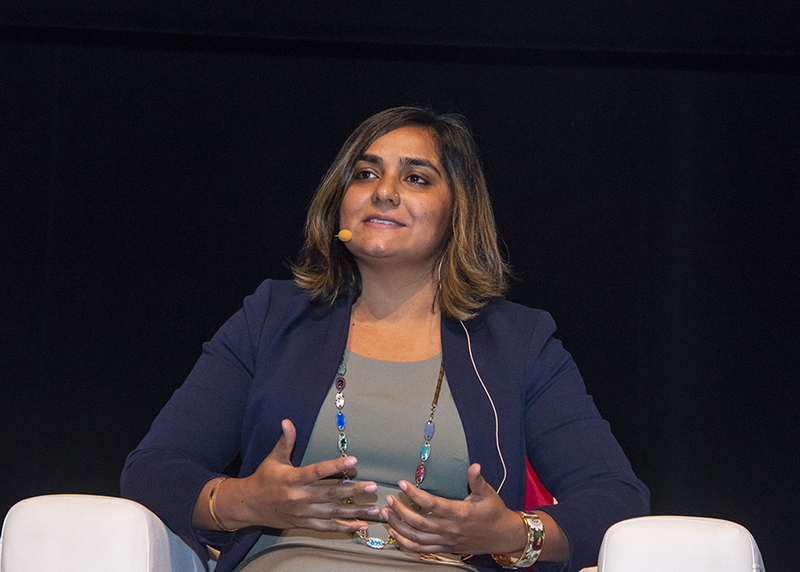 His fellow panelist, Bindiya Khurana from KPMG, addressed a student’s question about which aspects of accounting she believed could become obsolete in the near future.